Trash Free Trails are about to embark on a UK tour and you may remember a few weeks back I told you why I support this rider led non-profit. It’s more than simply getting litter out of nature and keeping woodland in its natural state. TFT/Trash Free Trails is about conscious decisions, changing attitudes to littering and single use plastics, engaging with different user groups and taking responsibility for the land we all share. I feel therefore, as an active trail rider and runner, it’s my duty to make sure I do what I can to ensure communities are maintaining the land they are using, so we and future generations can enjoy the physical and mental stimulation they allow us to experience. It may sound a little deep, but it’s true. “Our trails are under pressure like never before and, as mountain bikers, it is our duty to protect and conserve them. Join us in taking action this spring and help us take a huge step towards cleaner, greener trails” – Dom Ferris & Ben Gaby – Trash Free Trails. MUCH MORE THAN A LITTER PICK! Beginning with a bang at the iconic BikePark Wales venue, Trash Free Trails will launch their epic road-trip with a unique mix of #TRASHMOB trail clean-ups, rubbish rides, plastic pollution education activities, comedy consultation games and honest and open conversations with mountain bikers about the ever increasing amounts of litter on our trails! SPRING TRAIL CLEAN TOUR STOPS With trail cleans taking place from Bristol to the Scottish Borders there’s sure to be an event near you. Check-out the list below or head to www.trashfreetrails.org and sign-up TODAY! The eight Spring Trail Clean Tour locations represent a cross-section of purpose built mountain bike facilities used by hundreds of thousands of mountain bikers, of all ages and abilities, each year. So, instead of just bagging and binning the trash they remove, trail clean volunteers will be separating and tallying what they find to produce the first ever ‘State of the Trails – Litter Report’. “There is currently very little data out there about the amounts and impacts of litter on our trails and wild places. The evidence collected in our Litter Report will help us begin to paint a true picture of the trail litter issue, which is vital if we are to identify solutions and help shape impactful policy” – Dom Ferris. 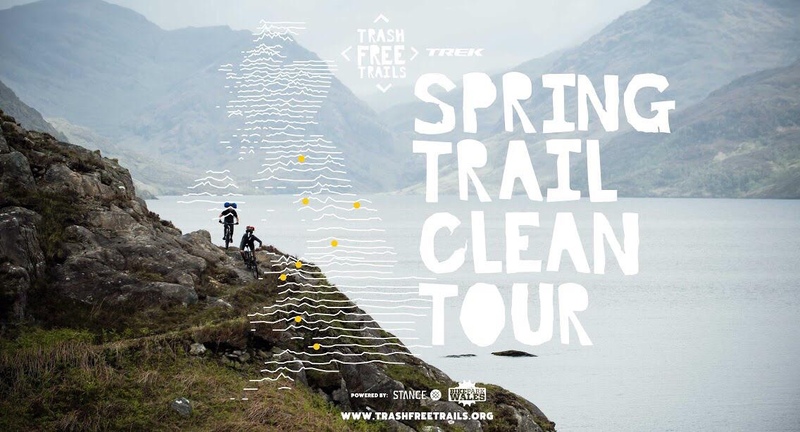 In addition to the Spring Trail Clean Tour, Trash Free Trails have been working with Trek Bicycle Corporation on increasing industry involvement and sharing ideas on the vital role that brands can play in reducing trail litter and plastic pollution. “We’ve seen a positive shift in people’s attitudes towards the role business plays in environmental issues, and engaging with industry plays a crucial part in getting our message out” – Gaby. The Spring Trail Clean Tour partnerships also extend to Stance socks and BikePark Wales, forming a powerful and progressive core support team. “Ensuring people understand our philosophy is essential to us when choosing partners. Stance and BikePark Wales share our passion and long term vision and we can’t wait to get started on the Spring Trail Clean Tour and future projects together”- Gaby. Sign-up for your nearest Spring Trail Clean Tour event and follow the Trash Free Trails teams progress on their plans to eradicate 75% of trail litter by 2025 here. I’m personally calling you out, yes YOU. If you’re a trail user and can head to any of the Spring Trail Clean Tour events above, please, head along, get stuck in and meet more people from our epic community. For more info on Trash Free Trails Click HERE & for a little bit of history and context, read on below. Dom Ferris created Trash Free Trails in a bid to bring the fight against the swathe of single use plastics scarring our inland environment. Experienced in delivering campaigns for marine charity Surfer Against Sewage, Ferris has been building the TFT community since 2017. Joining Ferris, Co-Director Ben Gaby brings his action sport industry experience to the fold. Ellie Ewart completes the leadership team, and brings her extensive knowledge of educational programs and design to the mix. The A-TEAM is the beating heart of Trash Free Trails. Tracy joins a group of 25 (and growing) permanent volunteers have pledged their time, talent and passion to represent Trash Free Trails in their regions (from Nepal to North Wales!) and protect and enhance the trails they love and ride every day.